I’ve always been a big proponent of thorough metadata in libraries. Collected Transients libraries have had it from the beginning. Focusing on the description field, I made sure to include everything someone might search for to find each sound. This is of course very useful, but is also easy to overdo. Sometimes a description might get a bit too long… more than anyone would read, including words that designers would rarely if ever type for a sound effects search. Worse yet, they might contain terms that would cause them to erroneously pop up in unrelated searches. While it’s great to have your library popping up in searches, it’s best to have them show up when they’re relevant and useful. With that in mind, I set out to “trim the fat”, so to speak. Removing any fluff words and phrases that didn’t contribute to making the metadata useful. I also took a second pass on each description, seeing if any truly useful keywords could be added. My mantra for the descriptions was “Everything you need… Nothing you don’t”. While all Collected Transients libraries had metadata, things weren’t always consistent. Description structure changed from library to library. Some files had notes, categories, mic information, etc… others did not. SUBJECT – Descriptor – Additional descriptors, Keywords. Alright, a metal nut… rotating… in a balloon? Sure, you probably won’t ever search the terms “Balloon” and “Nut” together, but maybe you’re looking for a “Rumble”, “Buzz”, “Spin” type of sound. With every sound effect following this simple format, useful sounds are easy to spot among the rest of your library. 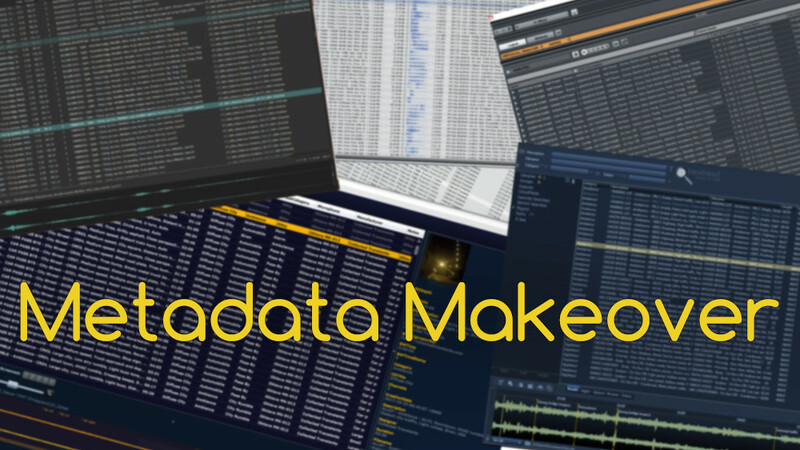 Each file in Collected Transients libraries now makes use of over 30 fields of data. From these fields, you can learn valuable information about equipment used, mic placement, recording methods, and much more. All sound effects also follow a structured Category/Sub-Category scheme to further help organize and categorize your library. Last but not least, each sound effect is embedded with an image of what was recorded. Sound designers and editors use a ton of software. Be it DAWs like Pro Tools, Nuendo, Cubase, or Reaper… Sound library software like Soundminer, Basehead, Soundly, AudioFinder, etc… or even just Windows Explorer and Apple Finder. I made it a point to ensure the data contained in each Collected Transients sound effect is as compatible as possible between all popular audio software. Even if you’re using software that can’t read metadata, you can always fall back on the sound effects filename… which is a mirror of the description field. So How Do I Get The New Metadata? Well, starting today, all Collected Transients purchases will now contain files with this new enriched metadata. You can preview the new metadata on the product pages or see it all in this Google Spreadsheet. If you’ve purchased Collected Transients libraries in the past and would like to take advantage of this, I’ve got two options for you. If you own Soundminer or Basehead (most versions), you can import the new metadata. There are a couple of downsides to this: The filenames will remain the same, and the new image metadata will not import. Also, because of the large variety of software versions and storage methods out there, I can only give a very rough outline of this procedure and can’t guarantee it will work in all cases. Proceed at your own risk and always make a backup of your database/files before making significant changes! If you’re using Soundminer, first you’ll want to delete all of the Collected Transients Library files from your database (Not your hard-drive!). You can then extract and import the data from THIS .ZIP FILE. On Soundminer v4 the option is called “Import text into database“, and can be found in the “Database” drop-down. On Soundminer HD, the option is called “Import Text“, and can also be found in the “Database” drop-down. In both cases it will ask you for the location of the sound effects in question. If you’re using Basehead, you can extract and import the new data from THIS .ZIP FILE. Simply click the Database Menu Button and look for “Import/Export Text File“. Be sure your “Separator” is correct and “Try to relink by [filenames] only” is checked. After import, the metadata will be in your database, but it will not be embedded in the files automatically. It’s always a good idea to embed the files if you want the new data to travel with them. This is the easiest option. Simply download the new files, and delete the old. Unfortunately, hosting and delivering large files like this reliably is far from free. To help cover part of these costs, you can download a new copy for $1.00 USD per previously purchased library. Customers who purchased any library from collectedtransients.com have been sent an email with details on this. However, if you haven’t received an email and would like to download the new library versions, simply CONTACT ME with your order details and I will set you up.